Rear Adm. Patrick O’Carroll, M.D., M.P.H., visited the School of Medicine on June 5 to deliver his lecture titled “Public Health and Prevention in the Age of Healthcare Reform,” as part of the Health Care Policy Grand Rounds Lecture series presented by the Department of Biomedical and Health Informatics. 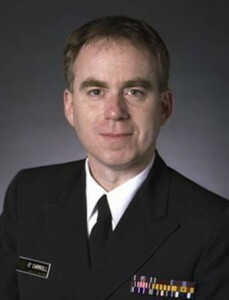 O’Carroll is an assistant surgeon general of the United States, the regional health administrator for U.S. Public Health Service Region X, and an affiliate professor at the University of Washington schools of Public Health and Medicine. He has also worked at the Centers for Disease Control and Prevention, giving him a unique perspective on issues of public health and ways to prevent disease, said Bill Lafferty, M.D., Merl & Muriel Hicklin/Missouri Endowed Chair in Medicine during his introduction of O’Carroll. The lecture outlined the 10 most effective public health interventions of the 20th century. These included vaccines, motor-vehicle safety, safer work places, control of infectious disease – huge improvements in infant mortality, for example – a decline in heart disease and stroke mortality, safer and healthier foods, healthier mothers and babies, family planning, fluoridation of drinking water, and reduction in tobacco use – still the No. 1 cause of preventable mortality. O’Carroll stressed the importance of prevention when it comes to public health outcomes. “Medicine can be thought of as a reaction if a system fails,” he said. Preventative care is practiced on multiple levels. At the individual level, it includes wellness visits and new private plans. At the business level, there’s workplace health, for example, and at the state level, there are many initiatives regarding community health plans. More than 12 federal agencies have developed a National Prevention and Health Promotion Strategy and a Prevention and Public Health Fund. O’Carroll also discussed the Affordable Care Act, the Consumer Bill of Rights, and the CDC’s bioterrorism preparedness and response initiative. Throughout his lecture, O’Carroll acknowledged the challenges of public health because its boundaries constantly change. “There are multiple disciplines and cultures, and sometimes an uncomfortable blend of science, action, research, policy, advocacy and government,” he said. Although, there is one aspect that O’Carroll emphasized as a top priority.